3 Americans were kidnapped in front of a New York City Mosque recently. Their crime– Taking photos outside the mosque. Angrry jihadists kidnapped 3 Americans and dragged them into the basement of the Masjid At-Taqwa Mosque in Brooklyn for questioning. The imam of this mosque, Siraj Wahaj, appears to have been an unidicted co-conspirator in the first World Trade Center bombing. 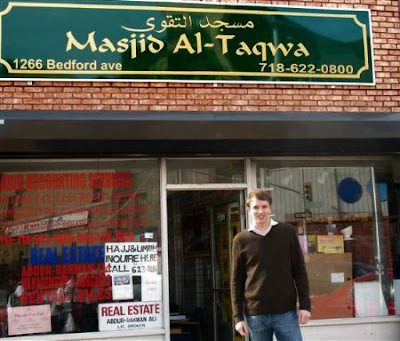 If you tarry in front of the Masjid At-Taqwa in the Bedford-Stuyvesant district and dare to take a photo, you might get hauled away by a group of angry Muslims in Islamic attire to the basement of the facility where a group of twenty “security guards” in karate suits will interrogate you. But it happened on a weekend in late April at 3:00 in the afternoon. Ali Kareem, the head of security for Siraj Wahaj’s mosque, conducted the grilling. A small, muscular man with a wispy black beard that has been dyed red with henna, Kareem demanded to know the reason why a trio of kafirs had dared to photograph the building on a public street without securing his permission. He further insisted on securing our identities and obtaining our motives for such a violation of Islamic space. Being surrounded by a group of militant guards in a mosque basement from which there is no means of escape is not a comforting place to be for a Wall Street financier. We tried to explain that we found the neighborhood with its halal meat vendors and food stores; Islamic dress shops, featuring the latest styles in burqas and hijabs; Muslim souvenir outlets, replete with bumper stickers stating “Don’t Be Caught Dead Without Islam”; and Middle Eastern restaurants offering a variety of goat dishes to be rather quaint and interesting. This explanation was not sufficient. Kareem was impatient and did not want a detailed explanation of the reason for our excursion (simple sight-seeing) or a graphic account of the sights we had seen and photographed. Realizing that we were in a bit of a pickle, my companion explained that we were interested in various religions and knew Siraj Wahaj, the imam of the mosque, was a prominent Muslim figure whom we would like to interview for a news outlet. This didn’t work too well since we could not produce a business card from a wacko blog, let alone credentials from a national publication. The last utterance seemed to be the “Open Sesame” that got us out of the basement and back to Bedford Street, where we managed to take a picture of the mosque before hailing a cab and making a getaway. The experience was disconcerting. Surely, anyone who takes a picture of St. Patrick’s Cathedral or the Riverside Church is not hauled off to a basement for questioning by a threatening figure in a karate uniform and a band of Ninjas. What is taking place within Masjid At-Taqwa?